Click on each picture for a closer look! Today when we think of express, companies like FedEx, Purolator and UPS immediately spring to mind but until the mid-20th century the parcel delivery business was a virtual monopoly operated by the railway companies. The Dominion Express Company was incorporated in Winnipeg in 1873 and taken over by the Canadian Pacific Railway in 1884, when the headquarters were moved to Toronto. The company provided the first all-Canadian express route between Eastern and Western Canada. Dominion's principal competition was Canadian Express, which had connections with the U.S. Wells Fargo and American Express companies. 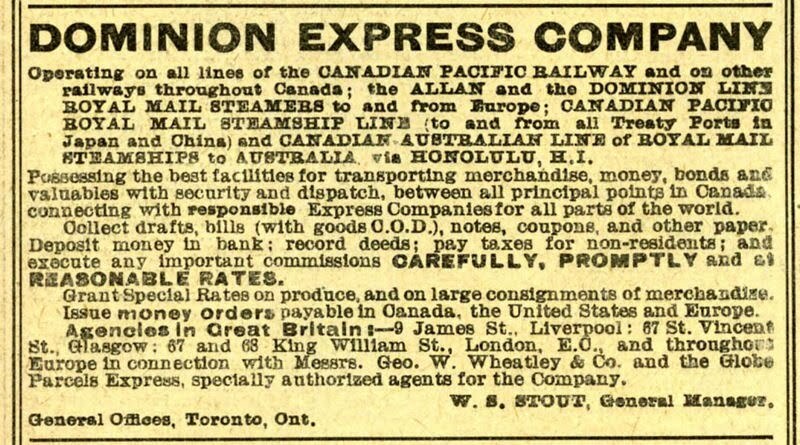 The Canadian Express Company operated mostly over the lines of the Grand Trunk Railway and built an express facility adjacent to Toronto Union Station in 1884. CEC introduced the first money order service in Canada in 1891. In 1921, CEC was taken over by the Canadian National Express Company. 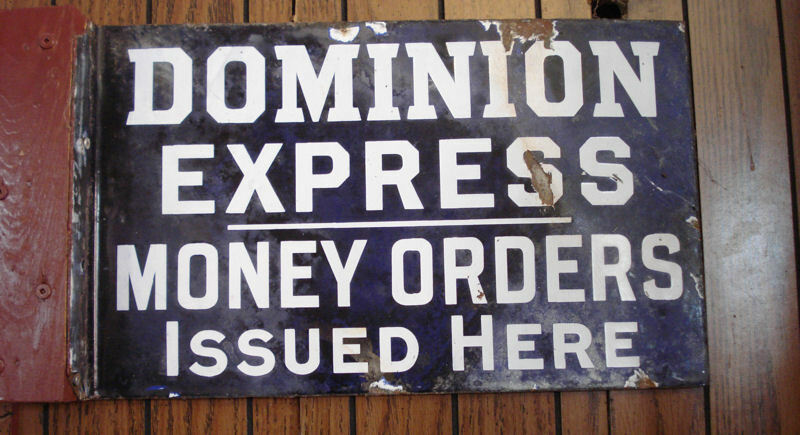 The sign in our collection dates from before 1926 as that was the year that Dominion Express was renamed Canadian Pacific Express. This sign could have been located in any CPR train station or ticket office. Up until the 1960s, express and money order services would have been available in our own Don Station. In an era before credit cards and the Internet, money orders were a safe means of transporting funds to distant places rather than incur the risk of mailing cash. People often headed for the nearest railway station when they needed to send money and the hours were far more convenient than banks which, in that era, were only open on weekdays and closed at 3 PM. Money orders had a $100 limit and in 1937 the service charge for that denomination was 24 cents. Today, Canada Post will charge you $5.50 (plus GST) for the same denomination. Other services offered by the railway express companies included Travellers Cheques, Foreign Remittances and Money Transfers by Cable. Many of these services are becoming increasingly obsolete as more people embrace telephone banking, PayPal and the Internet. Canadian Express occupied several facilities in downtown Toronto. One was at King and Simcoe Streets, now the site of Roy Thomson Hall. Express was usually carried on passenger trains so the main express facilities were located close to Union Station. The principal Toronto Canadian Pacific Express building was just east of Union Station, between Yonge Street and Bay Street, demolished in 2000 to make way for the Union Station GO Bus Terminal. The CN Express building was west of York Street and was modified into the Skywalk in 1989. The railway express business began to decline in the 1960s as both CN and CP discontinued numerous passenger trains along with the baggage and express cars that were part of their consists. The final nail in the coffin was in the 1980s when the railways abandoned the labour-intensive less-than-carload freight business. Today's express companies utilize trucks and airplanes exclusively. FedEx currently operates the second largest fleet of commercial aircraft in the world with 660 planes and Toronto's Pearson Airport is its most important Canadian hub. The Toronto Railway Heritage Centre is pleased to include in its collection this reminder of an era during which Canadians depended on the railways for far more than train travel. Here some captions for the additional images related to the Dominion Express Company which we have posted here as well. 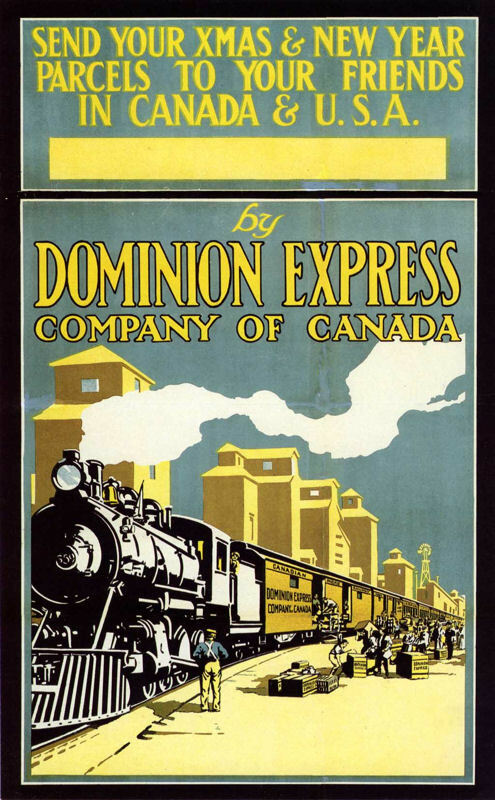 This advertisement for Dominion Express appeared in a 1901 CPR timetable. Also dating from 1910 is this poster showing a passenger train with two express cars being loaded at a station somewhere in the Canadian prairies. Express was extremely important to Canadians living in isolated rural communities. They could order merchandise at a reasonable cost from a big Toronto department store like Eaton's and have it delivered to the nearest CPR station. 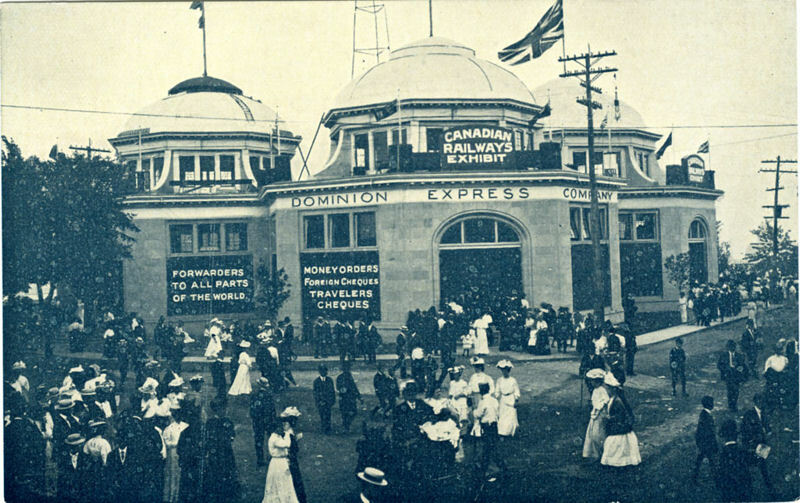 Dominion Express was prominently displayed at the Canadian National Exhibition in 1910. This was the Railways Building, which was built by Canada's three major transcontinental (or soon to be) railways in 1907. The three domes covered three inter-connected pavilions for the Canadian Pacific, Grand Trunk and Canadian Northern railways. From 1907 to 1950, with the exception of a few years during WW2, the Railways Building exhibited innovative displays promoting the wide variety of services available from the railways. The structure became the Music Building in 1968. Following a fire in 1987, the building was restored and is now rented out to a commercial sound studio. 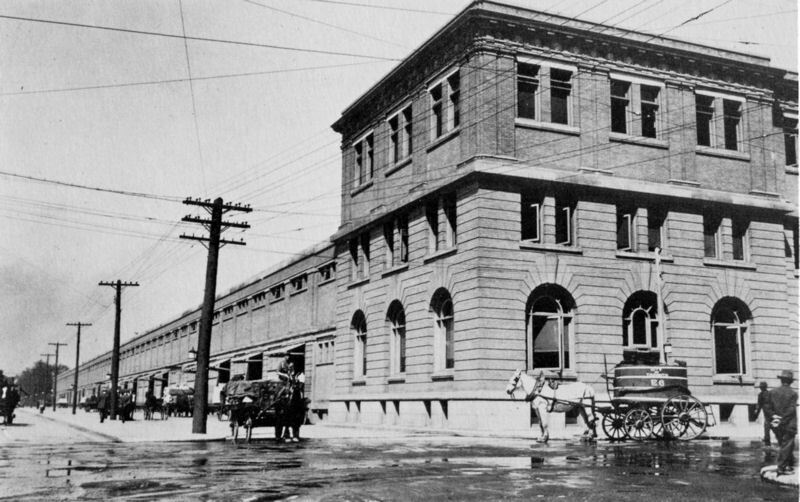 Canadian Pacific's Dominion Express built this structure on the northwest corner of Simcoe and Wellington streets in 1914. Canadian Pacific facilities occupied the entire block bounded by those thoroughfares as well as King and John streets. This site was previously occupied by Government House, the residence of the Lieutenant-Governor of Ontario until 1912. For many years, the lead track crossing John Street was guarded by the Watchman's Shanty that is now one of the four historic buildings making up the railway village in the Toronto Railway Heritage Centre. Canadian Pacific vacated this block in the 1970s and Roy Thomson Hall is on this site.